The St. Lawrence Seaway and Power Project, built jointly by Canada and the United States between 1954 and 1959, is the largest navigable inland waterway in the world and is widely renowned as one of the greatest engineering feats of the twentieth century. Moreover, in magnitude and scope, it is quite likely the largest transportation project ever undertaken in Canada and it entailed a massive manipulation of the environment. My paper for the upcoming Environments of Mobility workshop will focus on the Canadian perspective and explore the extent to which governmental and expert conceptions of nature, technology, and transportation shaped Canada’s approach to the seaway. The seaway is technically the 181.5 mile stretch of the St. Lawrence from Montreal to Lake Erie, including the Welland Canal, which features extensive navigation works. In total, the project encompasses two major power dams, seven large locks, and six canals. By providing unfettered vessel passage to the Great Lakes, deep draught vessels could travel almost halfway across the continent to the western edge of Lake Superior. Although discussions dated back to the late 19th century, Canada’s burgeoning industrial and trade potential in the post-1945 years provided the impetus to finally complete a deep draught canal system. In particular, the seaway would allow for the shipment of Ungava iron ore while providing an important transportation method (and hydro power) for Canada’s growing industry, manufacturing, and agriculture sectors. In fact, Canada attempted to build the seaway on its own, but an all-Canadian seaway was deemed a security and economic threat by the U.S., which used various means to force Canada to accept American involvement in the endeavour. I explore how post-1945 Canadian views of nature, state formation, property, and various forms of nationalism shaped the parameters in which Canada conceived of this transportation megaproject. I suggest that Canada’s approach to the St. Lawrence Seaway and Power Project was a result of the combination of a high modernist ethos with an environmental nationalism, deriving from the Laurentian and staples theses and the historic role of the St. Lawrence in Canada’s development, that framed the St. Lawrence as an exclusively Canadian resource. My contribution will concisely explain the construction of the St. Lawrence seaway and its environmental impact. 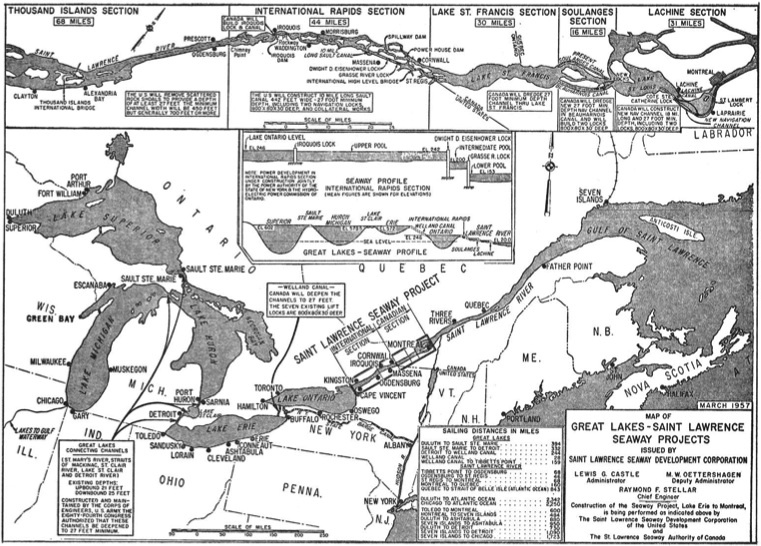 The actual construction of the seaway and hydro works involved many levels of federal and provincial/state governments, agencies, and authorities – in other words, an extensive network of “hydraulic bureaucracies.” It had an enormous visual and sensory impact on the St. Lawrence basin: billions of tons of earth and rock were moved, requiring extensive digging, cutting, blasting, and drilling. 20,000 acres of Canadian land were flooded to create Lake St. Lawrence, which required the relocation of numerous communities, farms, churches, cemeteries, highways, and railroads.